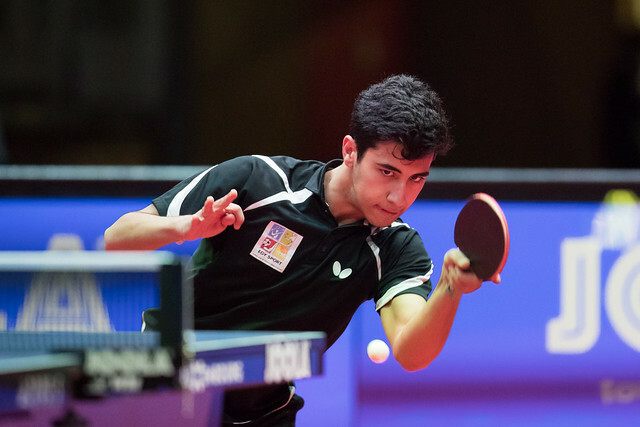 Brave efforts but on the late morning on Sunday 4th February at the Luxembourg 2017 ITTF World Junior Circuit Finals, the progress of Russia’s Denis Ivonin and Egypt’s Youssef Abdel-Aziz came to an end. Unexpected semi-finalists, both experienced penultimate round defeats. Denis Ivonin was beaten by Kanak Jha of the United States, the top seed (11-3, 12-10, 11-9, 11-6), Youssef Abdel-Aziz lost to India’s Manav Vikash Thakkar (11-8, 11-8, 11-5, 11-5). Defeats but as anticipated, Kanak Jha occupied the top seeded position in the competition; Denis Ivonin was the no.6 seed. Furthermore, on the one previous occasion when they had met, the Cadet Boys’ Singles event on the 2012 ITTF World Junior Circuit in Serbia, the decision had gone in favour of the American. Similarly, Manav Vikash Thakkar is the no.3 seed in Luxembourg and currently stands at the top of the Under 18 Boys’ World Rankings; Youssef Abdel-Aziz was the no.10 seed. On their one prior encounter, last year on the 2017 ITTF World Junior Circuit in Slovenia, Manav Vikash Thakkar had won in four straight games in their Junior Boys’ Singles encounter. The final of the Boys’ Singles competition will be enacted later in the day.